This is a very short blog as I am finished. I intend to write a little more tomorrow. Normally at the end of an exhibition you are tired but exhilarated. I am exhausted and although it is a happy culmination of three years work, as you who have read my recent blogs will know, it has been eventful for me. I met so many people today. Many who were so immersed in the paintings that they didn’t notice my face, others who were embarrassed and didn’t know what to say, and a few who either asked outright or commented that I had Been clever at matching my jacket to the colour of my face. It didn’t look good. In fact the bruising is now even under my chin. But my face only looks bad unless I touch it. My arm feels bad. It was so good to meet so many interested people today at the RHS exhibition. It really helped to take my mind off things for a while. Quite a few people were very surprised to find out that my Crab apple pictures were in coloured pencil and not watercolour. Hopefully I can encourage more people to start using it as a serious medium. It was lovely having the opportunity to meet so many other botanical artists from all over the world. The whole botanical art environment seems like one big family. People I met at the RHS when I exhibited in 2011, I met up with again in Pittsburgh at the opening of the Hunt Institute exhibition; who in turn introduced me to new faces (British and American) that I met again here at the RHS in the last few days. I had been introduced to the idea of the Hunt(Pittsburgh, USA) by an Italian artist when I exhibited in Lucca, Italy. It is a very small world and I am very lucky – and happy. This picture was sent to me by Alena Lang Phillips, who I met for the first time today – but have corresponded with via this blog. Thank you Alena. You have done a good job of making me look almost normal! < RHS Botanical art exhibition in London today. Such a lovely photo Gaynor, encompassing everything…….. It doesn’t hide much does it? But as I said to you, it was better to take a picture full face to show the damage, as even the best side was swollen and unnatural. A lot of photos were taken yesterday and next time people won’t even remember me other than if I fall downstairs again! Hi Gaynor – Alena is a good friend of mine – and it’s a lovely photo. You have done so well and it’s so helpful for me, in Australia, to read of your journey and done in such a way that makes us feel such a part of it. I hope you have a nice holiday or relaxation time planned to allow you to soak it all in and heal. Congratulations again! Hei Vickie, It was nice to meet Alena and she managed to take a pretty good pic given the circumstances. I’m glad that you have liked the blog. I am thinking of continuing a little longer with some of the pics taken at the exhibition, then you might get an even better idea of some of the artwork that was there. It was great to meet you, hope you will get better soon! Very nice blog! Thank you for providing the pic. I am so sorry I didn’t see you. I’m afraid that although I was there most of the time, the exhibition was a little messed up for me after the fall downstairs on Friday morning. I needed a few extra breaks because of the injuries. I’m glad that you liked the artwork. I agree that there was some fantastic work there, but every single person started off with nothing at one time, and has gradually built upon their skills as time goes on. When speaking with people, I expect you found that most of the artists still felt they had something to improve upon. That is what keeps us interested. I expect it will keep you going too. Hei Jessica, I am feeling so much better now and my head is beginning to clear a bit too. I am glad you liked my work. As you suggest fewer people use frames these days for the RHS as it is a huge expense. But, it does help. I loved your work and the way you got light into your pictures even without having to introduce very dark shades. It was lovely to meet you and see you working. It was a real delight meeting you Gaynor – and also wonderful to see your coloured pencil work earn a silver gilt medal. Thank you also for sharing your feedback and I hope our discussion was worthwhile for you. Keep applying those ice packs to the worst bruising! Hei Katherine, I really appreciated talking with you. You obviously have a lot of knowledge and use it most effectively to advise botanical artists at least. 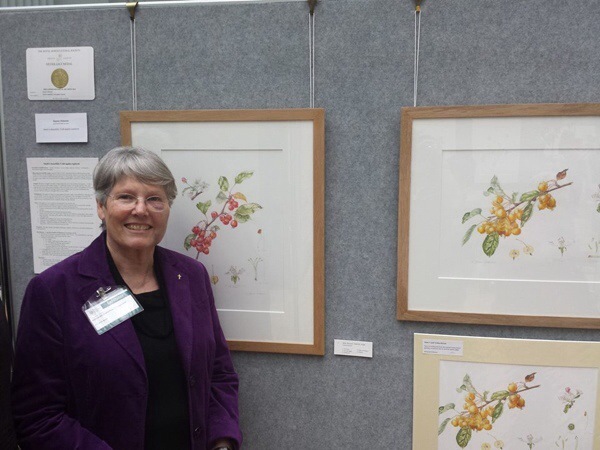 I was very happy to tell you what the judges had said to me as I strongly believe that my feedback can be useful to other botanical artists too. I am glad that you took the time to tell me and show me, how I can improve upon my exhibit for next time. Thank you.